Whistleblower Bradley Manning has been nominated for the Nobel Peace Prize, and he should receive it. No individual has done more to push back against what Martin Luther King Jr. called "the madness of militarism" than Bradley Manning. And right now, remaining in prison and facing relentless prosecution by the U.S. government, no one is more in need of the Nobel Peace Prize. Alfred Nobel's will left funding for a prize to be awarded to "the person who shall have done the most or the best work for fraternity between nations, for the abolition or reduction of standing armies and for the holding and promotion of peace congresses." The intent of the prize was to fund this work. As a result of enormous legal expenses, Bradley Manning is in need of that funding. Please sign this petition to the Norwegian Nobel Committee. 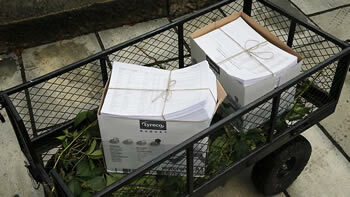 Petition delivery covered by: Reuters, AFP. Feel free to add a comment and we will deliver it in Oslo to the Norwegian Nobel Committee. 112608 2.9 years ago Jeremy Raikes Monte Rio,, CA , US He definitely deserves it! 112607 2.9 years ago John Coghlan Brooklyn, NY , US He took a contagious stand for truth and justice, and in doing so he has received no justice. 112603 3 years ago Terryl Todd Nevada City, CA , US Bradley Manning deserves this Nobel Peace Prize. His noble disclosure came from his consciousness of peace. 112590 3.2 years ago Evelyn Lewis Seattle, WA , US Peace is not possible without the kind of information that Chelsea Manning risked his life to provide us. Despite your enthusiasm, please do not sign more than once. We remove duplicates in order to maintain an accurate count of signers. Instead, please ask your friends to sign. Here's a flyer you can print, copy, distribute: PDF.